This just in from AnoushehAnsari.com — check out the new Videos Page there! You are wonderful!!! You are the real source of goodness. You deserved what you have experienced. Thank You again and I wish you a safe comeback. I hope you continue with your blog hier on earth 2,at least we get informed more and more about the progress of the X Prize. So Please go on with your blog.Thank you for all your effort! Just wanted to wish you good luck and thank you for sharing your adventure with us. Good luck,hope to visit you in Iran as soon as possible,you can help the development of astronomy in Iran. 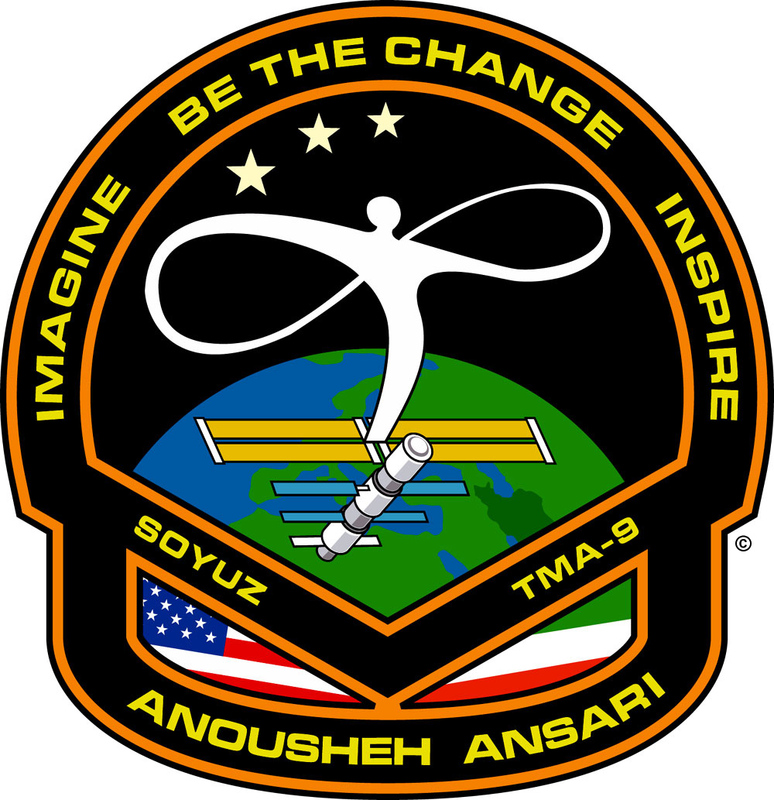 I’m Taher mahmoudabadi ,I’m mechanic engeenier, and I so glad and honer to see your blog and your film from space station.we’ll wait and pray for your comeback from space in best form an d situation. I have some invention that proove in iran and some important invention about space ship , sir plane , helycopter, jet ski, that I don’t want submit in iran, Do you help me to submit and prove my invention? I ‘ll wait for your answer. and I come to your blog every day. I know that you have so much visitor every time , but I wait for your help and message. have good time in space. وقتی پرچم ایران رو روی این لباست دیدم بی اختیار اشک تو چشمام جمع شد. Good luck,hope to see you in Iran as soon as possible,I think you can help the develpment of astronomy in Iran. It’s been a pleasure Anousheh. Thank you so much for giving us a vivid view of space with your words. You are a inspiration to us all! And thank you for opening your heart to us. It really was something to look forward to! I’m really going to miss your blog. Maybe you could continue another blog just to talk about life and how we all can pitch in to help make it better. Whatever happens may God always bless you and your family!! Have a safe and fun trip back to us. Anousheh, we just found your blog today and I (mom) was interested in it from a blogging perspective. I blogged about you today, blogs in space…so cool! Well, it has turned into a homeschool lesson and when I checked back at your blog to show my kids, we were delighted to see the video. My girls (ages 11 & 9 ) are very interested. Just wanted to let you know you are now a homeschool curriculum, as well as an ispiration. Blessings to you! Anousheh you are our hero!! What wonderful things you have contributed to all of humanity! Our growth and creativity and exploration as a species has been highly impacted by your generosity from the heart and hard work in pushing our technological boundaries forward. Thank you!! Hello, I am 19 years old and I am from Canada. I want to thank you, for paving the way to a public space for normal everyday people. I am a computer programmer, not a scientist, but thanks to people like you, I might one day have the chance to see our precious planet from space. You are fueling the dreams of thousand of peoples like me. Please enjoy every second of it. Congratulations for your great space adventure!! I wish a better world for all of us too. Hi Anousheh – Thank you for the new videos, they are great. You are a very talented person and excellent writer. Your Blog entries are very enjoyable and exciting to read. I can’t wait for your space experience book to be published, I hope you will write one. Again, thank you for sharing your thoughts with us here and best wishes for a safe return to Earth and for your future. a space lady, so far away from the earth. I think you’re experience wiill be precious for all of us. Does our planet seem so calm from you’re view? Well, for your multiple sunrises, listen our tune “A new sunrise”, follow the link!!! i got to see 2 seconds of the tape. i am not that smart! i must have jinxed the computer download!!!!! maybe it will work for me later. tonight i sit at my window watching the moon. it is so beautiful. from where you are, it must be totally awesome! اميدوارم، تا الان ماموريتتان به خوبي پيش رفته باشد. اعتماد به نفس شماو البته خانواده تان باعث شد تا من هم (كه عاشق نجوم و فضا) هستم ، اعتماد به نفس خود را باز يابم و سعي كنم تا به روياهايم رنگ واقعيت ببخشم. Blogging from space’s so incredible ! Well done for living life to its fullest. Its wonderful that so many people have been inspired by you (rightly so). My wish is that each person in this world realises that you too can live life to the fullest by just making the most of every opportunity as well as tragedy in your life. Don’t waste time rueing what is not but embrace that what is … all that is good and go whereever it is that life takes you. It might not be high above the earth like you Anousheh (we not all that lucky) but it doesnt mean it will be any less special. Anousheh thank you for the window into your experience …. Your venture to space is blowing me away and that’s quite a feat for a man turned 60 years old. Life in gravity can weigh one down, so missions like yours, to inspire and fuel creativity, are most welcome! Everyday I look forward to read your letter from space. You are an amazing woman, a great human being and a wonderfull writer, you should definetly write a book. God bless all of you up there. I am writing on behalf of my mother who does not have a computer but wants to tell you that is she is very proud of you. She considers you a role model to all Iranian women. Congratulations on your successful trip to the space. I wish you a successful and safe trip back to earth. I am sure your persistence in making a dream come true has inspired many people. I guess this is another occasion to quote Neil Armstrong: “That’s one small step for man; one giant leap for mankind”. Please pass to CAPT Lopez-Alegria my congratulations on his assumption of command aboard ISS. I watched the ceremony today, and I was very gratified that many maritime traditions have made their way to the endless seas of space, especially the trill of the bosun’s pipes!!! Go Navy!!! Thank you for sharing your adventure with everyone. I saw you fly over Maryland early Monday morning, a bright star in the dawn sky. I pray your adventure has brought the world a little closer together, inspired the flame of freedom, and helped to further the cause of exploration and human expansion into space. Have a safe trip home. You are truly an inspiration to human kind. From space international boundaries disappear. We are truly brothers and sisters as inhabitants of this planet. We must learn to love and care about each other no matter what language we speak, what color we are, where we live or how we worship God. I wish you a safe return home. You are such an inspiration to all of us, Anousheh. I remember watching the lift off of SpaceShipOne on June 21, 2004, and if it wasn’t for you or your passion for space, that would have never happened. I want to thank you personally for all of your hard work and commitment to this. Someday, I hope to travel to space as well. You made me feel like I can do anything, and if I really want it, it will happen. Thank you, Anousheh. Have a wonderful and safe time on ISS. Wow just amazing 🙂 Thank You so much for everything and wish You save trip home. You will be flying over Poland today couple hours before undocking and and I’m going to say thank You right in to the space. God Speed Anousheh, Jeff, Pavel. Good luck and once again thank You! I am very pleased to see the whole human race join each other in a single expedition to travel the space and explore the unknown. Curiosity is universal and doing something about it will show success at our human race just like it did in the past. For you Anousheh it must have been a reality that felt like a dream. I always wanted to go to space and I would still like to go to space. But I must accept that it is a tough process which for you it was achievable. I hope that other businesswomen and business man will follow your steps and hopefully the ticket to space will be cheaper for the rest of us. All the best in your endeavors, and may space be with you. Thank you for the short video from space, I have 2 daughters (3 month & 6 years old). I knew that when they grow up, they want to be like some one like Sam Carter (SG1). Now I am happy that they have a true and realistic hero like you. We are proud of you. Anousheh, you are so brave! And you’re doing amazing work. I wish you good health and blessings in all of your endeavors. Hey… its so cool we can read your blog from space! Hope your having the time of your life. ما همه از ته قلب ازت سپاسگزاریم و برات آرزوی یه فرود دقیق و بدون خطر رو داریم . Thank you, thank you. You have made a big hairy Iranian man cry with joy yet again with this video and your beautiful multi-national space suit. Anousheh,thank you for reminding us that our planet is beautiful. We’ve been treating it so badly we almost forgot. And thank you for being our embassador to the world of dreams. You speak about zero-gravity with such a candour you give us the feeling we’re there too..
Bon “temps spatial” Anousheh ! Ta vidéo ou tu portes nos couleurs me va droit au cœur. Dis, je veux un blouson comme le tiens !! so amazing u r in space. I dont have any words to express my feelings after seeing u on spaceblog.Keep it up ….. Thanks for doing a video serious for us terrestrials still stuck on Earth! I hope to join you up their along with millions of other humans wanting to make a better life for all. God bless and you really need to talk to the media about this once you come down. God bless YOU for long! WE Koreans sincerely hope that you will come back to this planet. Your voice must be that from the Heaven. You beautifully begins to believe ourselves to belong to the Heaven. Let me join the big hairy Iranian man to let you know that you have made this not so hairy Iranian woman cry too. Go girl. It is wonderful to see you up there. When I’ve heard about your trip I have shocked, because I love you, and I have been worrying about you, however now I really proud on your successes. Just I have left a wish on my heart, just to see you and kiss your hand. I love you. This is one of my poetry that I dedicate to your sweetie eyes. Barai bahareh chashmanat hangami keh parvaneh ha dar an tokhm minahand va atreh rihan dar an mipichad . Are you ready to come home? Remember the movie,”Wizard of Oz”? Have you put on your Ruby slippers? Coming home is the best part of the ride. Don’t forget to wave at the guy from Norway during your reentry. I’ve watched you cross over California the last couple mornings. The station is noticeably bigger. It’s time to close your eyes and repeat after me, “There’s no place like home..There’s no place like home”. Hope to see you some day on Earth. Your fan truly, Robert T. from Winnetka, Calif.
hey thanks for the video!! can you post some more? of the space station and earth’s photos? and how about the one you were saying of shampooing your hair? Reading your blog, has been one of the most enjoyable things I’ve done these past days. I sit together with my daughter, the 6 1/2 year old lady, to read and enjoy all your amazing stories. The only problem now is that she is full of questions that may be you might have to help me one day answer. It is amazing how kids think and see things different than adults, when they are being told of something that we, adults, more or less understand, as weightless conditions, etc. Their imagination just starts to fly. I just want to thank you for taking the time to share all your emotions and feelings, posted on your blog site during your trip. And the videos you posted today have been great. Thanks to your husband as well for sharing the limited video link between you and him. I believe you have been able to get millions of people, many of them young fellows, to think and work to achieve their dreams and a prosperous future for them with your inspirational messages. Enjoy the rest of the time up there, and have a safe trip back to Earth. We will be tracking your return closely. salam manam mesle to asheghe faza hastam forude khubi ro barat arezu mikonam.be salamat beresi. Great to watch your video blog and learn more things about the ISS, activities there, etc etc through your blog Posts. Take care and have a safe trip back home. I laughed and I cried reading your blog. You have made me so happy these passed few days. Have a safe trip home and keep shining over the World. اصلاوابدا زبان وقلم در پاسخ به ندای شما قاصر است. هرچه ازشمابگوئیم وبشنویم کم است. هرچه تعلقات پوچ زمینی بود دیگر رنگ باخته است. دیگر ایرانی ها به آسمان جوردیگری نگاه میکنند. حاضریم حتی با فروش ضروریت های این زندگی خاکی هزینه شما را تا 10 برابر 200 میلیون دلار برگردانیم. Please accept my deep congratulation for your amzing goal. Hope to be successfull, we are proud of you. God belss you for long life. My wife and I enjoy watching you in the space as an Iranian representative. We hope you’ll be in the best health. Please say our hello to the space! We’re looking forward to seeing you again as soon as possible and waiting for your reply (whenever you can). Now you’re near the merciful God, please ask to help us come to the US. در راهي كه طي ميكنم اميدم 10 برابر شده و حالا مطمئن هستم كه فقط غير ممكن ، غير ممكن مي شه. I hope you are health and happy. you are great glory for all persians. write more in persian pleaes. نمی دونم بدونی کردستان کجا هست یک تکه از آن غرب کشور ایران یک تکه در عراق یک تکه در ترکیه ویک تکه هم در سوریه و فقط شما اون بالا تونستی این 4 تکه رو کنار هم ببینی…. از این که یک بانوی ایرانی به این موفقیت رسیده خوشحالم. It may seem as if your journey is ending. . . I should say that OUR journey is ending. The journey in which you took tens of millions of people, young and old, on an adventure of a lifetime. Through your vivid imagery in your blogs, the pictures and today’s broadcast, you took us along with you on a ride most of us will possibly not be so lucky to experience. But believe me, we felt it. I felt as if I was right there in the shuttle feeling the motion sickness, entering the ISS, smelling space and looking out the window at the diamond-sky in my sleeping bag. For that, I want to thank you. You are an inspiration. As I said, it may seem as if the journey is ending, but in reality it is the other way around. The journey has just begun. . . for all of us. From a 7 year old in America who wants to become a movie star, a homeless person looking for a job, to students in Iran who want to fight for their freedom. . .
To those who know your story, you have created a revolution inside all of us to reach our dreams which once seemed so far away . . . In principle though, they are all ONE. آرزو دارم كه پس از بازگشت به زمين حتما سري هم به ايران عزير بيايي تا بتوانيم به نحو شايسته وجود توست ، از تو استقبال كنيم. در ايران تمام ايرانيها به وجود تو افتخار ميكنند و همه برايت آرزوي سلامت- شادابي و تن درستي دارند. I just wanted to tell you that we are so glad to hear your stories from the international space station. Thank you so much for sharing your amazing experience with all of us down here ! You truly are a wonderful person ! If only everybody on earth could share the very same feeling you got… and start taking care of the most valuable and beautiful ressource we have; the cradle of human kind: the Earth! besyiari az mardom dar iran be shoma eftekhar mikonanad va moshtaghaneh montazere didane shoma dar iran hastand. ba arezoye movafaghiat roz afzon. omidvaram har koja bashid zibaei haye zendegi ro behtar va bishtar bebinid. man va hamsaram shoma ro doost darim. Are you able to spot Caspian Sea from the distance that you are? Which geographic bodies are easily recognisable? همسرم و من به شما افتخار ميكنيم. I tried several times to send you HAFEZ poems in farsi but don’t know why I could not send you those txts and not accepted. any way hope god keep you safe on your return fly back to earth. I can not find any right word for the great things you have done specially for Iranian people. WAITING FOR RECEIVING YOUR EMAIL IF POSSIBLE. maybe this time you will receive. anyway I hope the bests for you…. any way hope god keep you safe on your return fly back to earth – home. salam bar anoosheye aziz va eftekhar afarin. omidvaram foroodi arami ra hamrah ba salamati dashte bashi va az in pas shahede movafaghiyathaye roozafzoonat bashim. ambitious and strong she can be in reaching the great goals. I hope we all learn from your achievements and strength and self steam. Best of luck and have a safe journey and safe return back home. Thanks for showing us the path. We are all proud of you. Jusqu’à maintenant j’ai commenté que 2 fois pour ne pas te déranger trop.J’éspère pouvoire te contacter pour te parler, ou peut-être te rencontrer si jamais tu passes par la Suisse. Encore une fois Bravo pour tous ce que tu as fais et bonne continuation. افتخار مي كنيم شما به عنوان يك ايراني توانستيد با موفقيت پاي در فضا بگذاريد. قعطعاً به كوروش كبير نزديك تر بوديد. خوشا به حال شما و احسن به تلاش و پشتكار شما. لطفا تجربيات و موفقيتهايتان را براي مردم ايران نيز انتقال دهيد و در صورت امكان در برنامه تلويزيوني ايراني نيز شركت كنيد. اگر امكان داشت جواب ايميل ما رو هم بديد . من و دوستم هوشنگ سفر تاريخي شما و موفقيتتان را تبريك مي گوييم اميدواريم هميشه موفق و پيروز باشيد. ما را فراموش نكنيد و در صورت امكان جواب mail را ارسال فرماييد. en behtarin khatereye tabestan va payeeze emsalam bood . mer30 anousheye aziz. mofagh bashi. از زمانی که در جریان سفر شما به فضا قرار گرفتم بسیار خرسند و خوشحالم و به خاطر ایرانی بودنم احساس غرور و افتخار بسیار زیادی دارم . همچنین لحظه به لحظه اخبار مربوط به سفر شما را بی صبرانه پیگیری می کنم. امیدوارم دستآوردهای سفر شما از هر جهت برای این جهان خاکی و ساکنینش بسیار ارزنده و با پر افتخار باشد. بی صبرانه منتظر فرود توأم با سلامتی شما در ساعت 4:40 صبح روز جمعه به کره خاکی هستم. آفرین بر سعی و تلاش شما. I hope you come back safe and see you in your country Iran too.I think you are successful person in your life.and I wish I could see earth like you from space.I hope you answer all private email which sent to your personal email as soon as you arrive.shoma ba ese eftekhare Irani ha hastid. We are students from MATI-moscow state aviation technology university. Congratulation! Wish u have a safe landing to earth. I hope first you comeback home safe and see you as soon as possible o the earth.I think you have helped many young boys and girls to try to have whatever they want with working hard and studying. امیدوارم که به سلامت برگردی. Maybe it is the last comment I can write before you get back to the mother Earth, and I would like to use this last opportunity to thank you very much while you are still away, for all the hardwork, your life you put on this journey, the money you spend (which beleive is the least important regarding all the other valuable things you have risked till now, and the inspiration to many many people and from many different aspects. Being in computer industry for more than 15 years now, I have never been that interested in somebody’s weblog, and I doubt if I have ever commented people’s writings in blogs ever, and that shows how interesting your work is. I don’t know what people can do to appreciate you, as your personal achievement is enough huge, not forgetting how many others have also helped this happen (this is specially to Mr. Jim Palmer who said you have not mentioned USA in your journey, I beleive you have already done lots of good things to USA in appreciatation of what that good country and its good people have given to you). What I know, is that people can at least put some more time in thinking about your writings, in depth. They can think how great your words about peace are and the fact Earth has no real borders, and that it is a very pretty planet, that has no twin in such a big universe, at least any twin within our access. I know people should help more preventing destroying our own nature, our own atmosphere which I beleive is a gift from God. Anyway, people can respect and I beleive they SHOULD respect you for what you have done. You are now a real Heroin to many many kids, teenagers, older and youngers, men and women. I think you should be a UN ambassadore for peace as well. You are immortal now, and you yourself have made yourself immortal, just by doing the right things at the right times, congratulations, and have my best wishes while you return. I am eagerly waiting to see how and from where I can get some views of your return. Just wanted to add my voice in thanking you for sharing your experience in this way. An aging ER doc, I have been a wannabe astronaut since watching TV in elementary school in the Alan Shephard, John Glenn days. After finding out about your space trip thru a NASA link, family, co-workers, friends and I have been able to vicariously join you in space in a much more candid and intimate way because of your blog. You have touched the hearts of many more people than you can imagine. You have put a human face on spaceflight and helped connect diverse cultures of people on the ground as well. Please continue to share your life journey with us after your return to Earth. I am sure the adventure is only beginning. i wish for you that you come back safe.you are so brave. Did you know that the chief commander of Iran’s navy in Hakhamanehian Dynasty was a lady called “Artemis” who was a brave and wise commander according to the Greek Historian? Did you know at least 2 of our kings in Sasanian Dynasty were ladies? We are so proud of you. Please enter politics. You have the power to make world a better place to live. i wish for you that you come back safe. We are all proud of your high flight. Please show to all people on the earth that where IRAN is. دعاي سحرگاهي تمام ايرانيان در اين ماه عزيز در هر لحظه بدرقه راهتان باشد.خدا يارو نگهدارشما. all of the blessings to you. je suis de paris et suis extremement ravi de voir une femme dans l’espace surtout un particulier!! c’est une reelle avancé et une tres bonne chose!!!! I wih you a safe return. I just cross my fingers for you, Anousheh to have a safe landing and more brilliant future.. Very happy that your dream to travel to space is now accomplished, I share that dream and imagine to travel in space thanks you and all others since Gagarin and Neil Armstrong. I get choked up when ever I visit your blog! Congratulations on this amazing experience and thank you for sharing it with the rest of us! I am so proud of you! I always dreamed of working on a space station. Thank you for sharing your journey. It was almost like being there. Safe trip home Anousheh. Many more journeys lay ahead for you. We all Iranians are proud of you. براتون ارزوی موفقیت میکنم وخوشحالم که به ارزوتون رسیدید. I just wanted you say’hey have beautiful day. انوشه عزیز سلام.به تو برای تحقق رویایت تبریک میگویم.الان در ایران ساعت 6 بعدازظهر است و 2 ساعت به بازگشت تو مانده ومن نگرانت هستم.امیدوارم به سلامت بازگردی. I Just wanted to say’hey have beautiful day. Thanks for sharing your heartfelt views of outer space and our beautiful planet…they are very poignant…your descriptive view of pressing your head against the glass until it hurt….not wanting to sleep, but forcing your eyes to stay open… to take in the 100 shades of blue below ….and stars above… wonderful…. I hope your infectious enthusiasm for life and science is contagious and we all celebrate our differences while pressing our faces against the glass and look out with wonder and glee. Please keep your blog going when you arrive back on the planet!!.. I would love to continue reading your insights, ideas, and observations about our beautiful little blue planet. You are a great glory for iranians. i hope you be health and happy. dear Anousheh! write about space more at persian please. we like that read Anousheh’s note in your maternal language. we love you, thanks for your video message too. از تمام چیزهایی که به من دادید متشکرم وبراتون ارزوی موفقیت وسلامتی میکنم. Your book will be a top seller for sure, as you are not only an adventure person, but also a great writher. Please add a CD/ DVD to your book as well, so that everybody can enjoy watching your trip experience to space. Keep in mind, not every body in the world have internet access at home! Also having your book in at least 2-4 languish will help too. salam bar shirzan parsi iran. 2min peyghame khodam ro ba arezoye bazgasht va forodi movafagh baraye on banoye jasor, tavanmand, 100 albate bagheyrat va hesse nasiunalist miferestam .omidvaram salamat be koro por neemat elahi bargardid va ma baraye shoma dar iran jashn begirim .didar shoma dar iran baraye tame iraniyan hamrah ba gereftan jashn khahad bod. ma lahze shmari mikonim.thanks for every things. salam bar shirzan parsi iran. dovomin peyghame khodam ro ba arezoye bazgasht va forodi movafagh baraye on banoye jasor, tavanmand, 100 albate bagheyrat va hesse nasiunalist miferestam .omidvaram salamat be koro por neemat elahi bargardid va ma baraye shoma dar iran jashn begirim .didar shoma dar iran baraye tame iraniyan hamrah ba gereftan jashn khahad bod. It is unbelievable.I have just arrived in Goteborg,Sweden to continue my studying toward master programme with this hope in my heart that I gonna do something special!!! zende bad Iran va zende bad in khanome ghahreman. من و امیر وقتی ده یازده ساله بودیم، ساعتها پشت بام خانه ما یا امیر اینا خیره به آسمان می نشستیم با دقت و در سکوت… تا شاید یکی از یوفو هارو ببینیم یا یه جوری باهاشون تماس بگیریم…علامتی خبری چیزی…به طور جدی مطالعه می کردیم و پیگیر بودیم و وسایل ارتباطی اختراع می کردیم…کار به جایی رسید که با هم نقشه ساخت یک هواپیمارا آماده کردیم و مادرم به ما پول داد تا اونو بسازیم…البته ساختیم و پرواز نکرد………………………امیر الان که یک مهندس عالیرتبه در کارخانه بنز هستش مجبوره آرشیو عکس و خبر های فضایی شو از بچه هاش قایم کنه و من از همسرم…چون می دونی که …زود به عقل آدم شک می کنن(من هنوز نقشه اونو دارم)…ما هنوز هم برقراری این ارتباط رومنتفی نمی دونیم!و وقتی دیدم انوشه انصاری حرف از به حقیقت پیوستن رویا ها می زنه، خیلی هیجان زده شدم…و احساس غیر قابل توصیفی پیدا کردم..اینکه ما تنها نیستیم و یک قهرمان پیدا شده که تخیلشو به واقعیت پیوند داده…آه باید تصور کنی که تصویر تو روی مانیتور های کامپیوتر های شرکت چقدر سوال برانگیزند ولی هیچکس زحمت پرس و جو از یک مدیر خیالپرداز را به خود نمی دهد شاید هم دلایل دیگری دارد…. with the great regards to magnanimous mrs ANSARI. because of you.your words emotionalized me and i decided to atone. therefore i will come to you in years later and i wish that you employ me in your company.i request to you to memorize my name because you will meet me soon and i’m really glad of this event. do not forgot to mail me. oon shab ke Youri Gagarin pasho gozasht faza in ahange por ramzo raze marhoom Parvin az tv pakhsh shod. emshab dar del shoory daram, baz emshab dar oje asemanam. baad az moddatha saate 5 sobh az khab bidar shodam faghat be yek angize.inke ISS ro az rooye zamin bebinam.ye irani oon balaha bood. gahi be aseman negah mikonam dar hasrate kande shodan az zamin. man be in fekr mikonam ke cheghadr delet tang mishe baraye oon balaha .akhe 6 saat dige gharare beresi be inja, be hamoon zamine khastekonande. You are the great woman, like Darius who was a great man in our history.. you showed the world , Iranians can do whatever they deraming and want..
we all proud of you and hope to see you in our country Iran.. I just proud of you. You have showed to the world, persians can do anythins they want…………. When are you going to have a page on http://www.myspace.com? بازگشتت رو به زمین تبریک می گم.مایه مباهات و افتخار ایران زمین هستی. We all iranian are proud of you , keep goning to be peresident of USA very soon and make the world free, you have to know that’ all iranian and most american people will suport you. just be anoushe for ever. بازگشت سالمتان را به کره زمین به شما و خانواده تان تبریک می گویم. خدارو شکر در محیطی پرورش یافتی که توانستی استعدادت رو به ظهور برسانی و به آرزویت برسی. بازگشت سالمتان را به کره زمین به شما و خانواده تان تبریک می گویم. Congratulations for your great space adventure! rasti az oon bala donya cheghad bozorg bood? its still in my dream i be there ..
من اولا خيلي خوشحال هستم كه سلامت به زمين بازگشتيد وثانيا خيلي خوشحال هستم كه با افتخار وبا شكوه به زمين بازگشتيد شما افتخار ايران هستيد هميشه موفق وسربلند باشيد. من به عنوان یک دختر 16 ساله ایرانی یه خواهر بزرگتر خودم یعنی انوشه خانم افتخار میکنم. khoshhalam ke salem salamat be zamin bargashte omidvaram movafaqh be azmayshate ke arzohayash ra dashte angam bdahe rasedah bashe. I CRIED TWO TIMES THE FIRST WHEN YOU WENT TO SPACE AND SECOND WHEN YOU CAMEBACK TO EARTH.THIS CRING FOR HAPPINEST.THIS CRING FOR SUCCESSFULLY OF FIRST WOMEN JOURNEY. اولا از بازگشت موفقیت امیزتان به زمین مادر اول و اخر ما بسیار خوشحالم و ثانیا امید وارم هر چه سریعتر شما را در ایران سرزمین پارسیان ملاقات نماییم. اميد وارم شاهد موفقيت هاي چشمگيرت باشيم . بله ایشان در زمانی که به معراج رفتند که در این مورد شکی وجود نداره نامشون رو به عنوان اولین فضانورد مسلمان ثبت کردند. چون معراج پیامبر جسمی بود و و نه روحانی. فرق سفر ایشون با شما در اینه که ایشون مجانی رفتند به فضا ولی شما هزینه اونو پرداختید. گل کاشتی انوشه جان … ثابت کردی ایران هنوز زنده است . Thank Anousheh for inspiring those around you and for telling those to follow their dreams! I am doing that now and wondered what took me so long! ضمن خیر مقدم و به عنوان یک مسیحی ایرانی همانند شما به کشورم و به ایرانی بودنم میبالم. شما با از خودگذشتگی به رویای خود و به رویای بسیاری از هم میهنانمان جامه تحقق پوشاندید. حالا ما هم یک مدرک دیگر داریم که نشان دهیم ایران و ایرانی بزرگ است. Hi there, I actually just found your website by accident….I’m here at work right now and I just wanted to comment on how great your blog is! The way you describe your stories makes it almost seem as if I was right there experiencing it with you! What you gained from this space experience?.You paid billion dollars for this journey.Do nt you know people dying dying due to poverty in Africa and elsewhere.They do not have clothes to wear.Allah will be happy if you would have spend money for that charity instead for this proud useless journey. khanoom anooshe ansari vaghan khoshhalam ke ye ki az tarafdaran shoma hastam omidvaram ke hamishe dar tool marahele zendegiyetan moafagh bashid. matrah shodan zan irani dar gahan neshan dahande gheyrate balaye irani va irani bodan ast va baraye man hamin bas ke ba shoma hamvatan hstam.goodbye. I wish I was a spoiled brat with 20 mil to go into space and waste the consumable resources of the ISS. It’s disgusting! i am realy crazy to know how much is interestintin to eat ice_cream in the space!!!??? iran is more bigger or america in the where u there? سلام.سلام من رو از ایران و از یک َهرستان کوچیک دریافت کنید. سفر غرور آفرین شما برای همه ی ما آیرانی ها مایه ی افتخاره. ان شا الله همیشه موفق باشید. اميدوارم هميشه شاد باشي و موجب افتخار هيران…. we love you dearly and very proud of you,keep up with the great work and i can’t tell you how impresed everyone is with all your achievments. سفر شما به عنوان یک ایرانی مایه افتخار و سربلندی ملت وکشور عزیزمان ایران می باشد . من به عنوان یک ایرانی به شما افتخار میکنم و مادرم و همسرم هم به عنوان زنان ایرانی شما را دوست دارند موفق باشید راه شما برای سربلندی ایران همواره پر رهرو هست . من از شهر گرگان شمال ايران به شما و خانواده عزيزتان عرض سلام دارم . anoushe jun kheili bahali.duset daram!!!!!!!!! ای معیار زنان همچون کوه دماوند سرزمین جاودان ایران ما به تو و عمل تو افتخار می کنیم .من جواد 19 ساله از رشت شمال کشور زیبای ایران. امیدوارم خورشید عمرت همیشه تابنده باد. To restate the above, the pleasure was all ours! Thanks to you Anousheh, for taking the time and trouble to share your voyage. Happy travels back on Earth~!